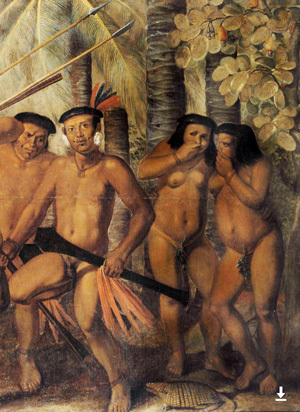 In the late 1400s AD, the Tupi people had just won a big war with the Tapuia people. They had gotten control of the Atlantic coast of South America (modern Brazil). 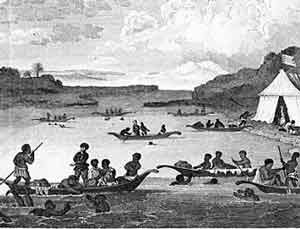 They forced most of the Tapuia people inland. So the Tupi were living near the beaches, fishing and farming. How did the Tupi live? Different Tupi groups had different rulers, but they all lived more or less the same way and spoke the same language. There were probably about a million of them. What did Tupi people eat? 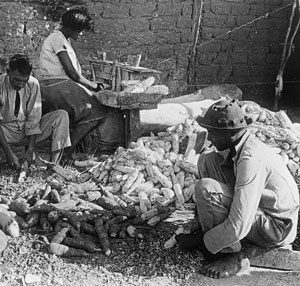 They were mostly fishermen or farmers growing a variety of South American plants: corn, yuca root, sweet potatoes, beans, peanuts, tobacco, squash, and cotton. Enslaved Africans pearl diving in Brazil. When did Europeans reach Brazil? In April, 1500 AD, the first trading ship unexpectedly arrived from Portugal, with Pedro Álvares Cabral. The Tupi people could not defend themselves against European weapons. So the Europeans (many of them Jesuit priests) enslaved many Native men and women and forced them to work. The Europeans forced the Tupi to mine silver and dive for pearls. Or they had to grow sugar cane, cattle, and tobacco to export to Europe. 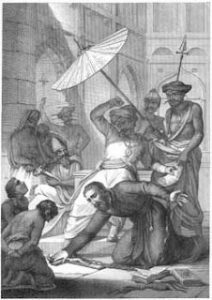 Most of the Tupi soon caught European diseases – smallpox and measles and malaria and dysentery – and died. Others died of starvation and overwork. There were many accidents in the dangerous mines. 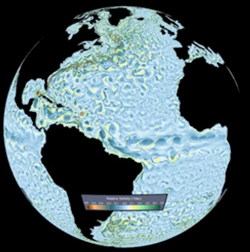 History of Brazil: Ocean currents went right from West Africa to Brazil, making it easy to import African people. In the early 1500s, Spain became part of the Holy Roman Empire, and so did Brazil. The Europeans began to bring over thousands of Africans who were enslaved to work in Brazil. Most of the Africans who were enslaved were sold in Brazil – millions of them. The Holy Roman Empire was under Charles V. Charles V ruled not only Portugal but most of Europe: Spain, the Netherlands, Germany, Austria, Hungary, and most of Italy. How did he get control of Spain? All together, more than four million people came to Brazil as slaves. Most of them died of overwork in a few years. They brought yellow fever with them. So many native Tupi and Tapuia people died of yellow fever in 1685. Meanwhile many Europeans got rich selling Brazilian sugar, silver, and pearls. Portuguese soldiers fought French soldiers to extend Brazil further north and south along the Atlantic coast. In the late 1600s AD, with Queen Mariana ruling Spain, Portugal seized its independence. So Brazil became part of the Kingdom of Portugal rather than Spain. But the Portuguese colonizers still relied on African slavery. When Angola’s Queen Jinga Mbandi in Africa refused to sell any more enslaved people to Brazil’s settlers, the settlers sent an army to Angola. That was in 1661. The Brazilian settlers defeated Jinga Mbandi and the Angolans so they could get more slaves. Brazil couldn’t sell as much sugar or silver by the late 1600s, but then explorers found gold mines, and Brazil got rich again selling gold. Many people came from Portugal to Brazil to get gold. Jesuits owned more and more of the wealth in Brazil: farms, mines, ranches, everything. They started to grow coffee in Brazil too. In the 1750s, Portugal’s kings threw out the Jesuits and took over the huge plantations and ranches that the Jesuits controlled. Then in 1808 the King of Portugal moved to Brazil for years, running away from Napoleon. The British defeated Napoleon in 1815, and the King of Portugal moved back to Portugal in 1821. He left his son, Pedro, in charge in Brazil. 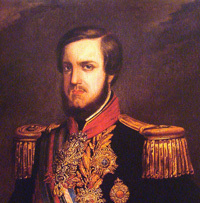 Prince Pedro then fought a war against his father for independence and became Emperor Pedro of Brazil. So Brazil was an independent country, but still ruled by European settlers. To build up the population, Emperor Pedro encouraged people to move to Brazil from Germany, and many did, especially after the European revolutions of 1848. But a lot of Brazilians hated Emperor Pedro. He quit in 1831, leaving regents to rule in the name of his 5 year old son, Pedro II. When Pedro II grew up, he built clean water systems, sewage systems, and railroads. When did Brazil finally end slavery? But even after independence, and even after the United States’ Civil War freed African-Americans in the United States, Brazil’s government still insisted that slavery was the way to go. 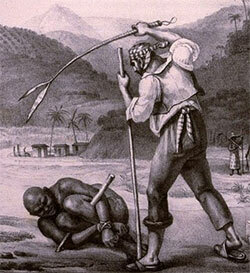 Many American slave-holders moved to Brazil after they lost the war, so they could keep on owning and abusing people. Slavery didn’t officially end in Brazil until more than twenty years later, in 1888, and even after that (as in the United States) many people of color still worked under terrible conditions, as sharecroppers or laborers. But because Brazil couldn’t force any more Africans to come to Brazil, they encouraged lots of free people to come from Italy (where Pedro II’s wife came from) to work on the coffee plantations. A year after slavery ended, in 1889, the army threw Pedro II out and started the Republic of Brazil. By the early 1900s, people were coming to Brazil from Japan, Syria, and Lebanon, as well as from all over Europe. More recently, many people have been moving to Brazil from China. The history of Brazil is one of immigration from many different places, but there are still a lot of people in Brazil who are descended from Native Tupi and Tapuia people. Did you find out what you wanted to know about the history of Brazil? Let us know in the comments! Looking for more? Check out this article from the Encyclopedia Britannica. Cite this page: Carr, K.E. History of Brazil – Brazil and colonization. Quatr.us Study Guides, September 8, 2017. Web. April 20, 2019.